EA gave us a tacky error logging system, this program combines all its logs + LOADS more into a single file. 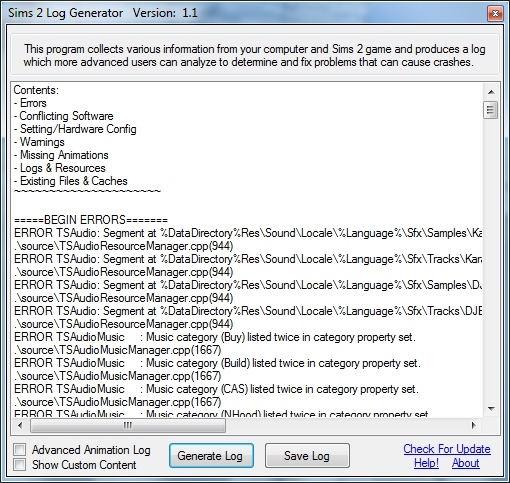 The log generator can be used by game help and support people and everyday players to help find out exactly whats wrong with their Sims 2 game. Due to my own limitations, it does not work with some languages - Sorry. - Checks for CEP files. [ADDED] Optional Scanning of Custom Content. [ADDED] Option to select Advance or Simple anim mode. [REMOVED] Advanced missing animation solo-button. How do I know what files are missing? I hope you get some use out of this little program. 3. This program does not require installation. Simply download and double click the .exe file to launch.